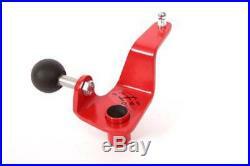 4H-Tech H4 Shift Shortshifter for Peugeot 206 GTI S16 2.0L 136bhp (No RC) Models. If you are in any doubt which Shortshifter you require. This 4H-Tech H4-Shift is especialy designed for the Peugeot and Citroën BE4R gearbox. It makes faster shifting in gears possible. Also known as quick shifter. By fitting this shift linkage you will have a gear throw shortening of about 35%. The factory gear stick model and height remains unchanged. The short shifter will be fitted on the subframe of the car (behind the engine) where the shift linkage is located. Fitting is very easy and simple, it will take only 10 minutes to fit this short shifter kit. This kit comes included with all new nylon bushings and fasteners, so your gear stick will feel as factory new, without any play. Gear changes are much quicker and precise. Also fits other peugeot and Citroën models. See below for exact specificatons. Product Features: - Improves performance - Faster Shifting - Made in the Netherlands by 4H-Tech - 35% Shortened gear throw - Very easy to install and operate 10min. Completely reversible to stock - Made from very high quality steel. 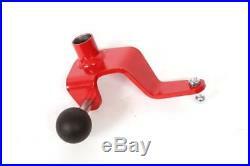 RED powder coating finish - No modification neccesary to the gear stick it selve. Comes with complete new nylon bushings and fasteners. Package Includes: - Shift linkage - Nylon bushings - New shock adsorber joint - Fastening bolt and washers - 4H-Tech Sticker - Fitting guide. Applications: Citroën Berlingo Petrol: 1.1i 60Bhp, 1.4i 75Bhp, 1.6-16V 109Bhp Citroën Berlingo Diesel: 1.6HDi 75Bhp, 1.6HDi 90Bhp, 1.9D 69Bhp, 2.0HDi 90Bhp Peugeot 206 CC 1.6 16V 109Bhp, 2.0 S16 136Bhp Peugeot 206 1.1i 60Bhp, 1.4i 75Bhp, 1.4-16V 88Bhp, 1.6 16V 109Bhp, 1.6i 89Bhp Peugeot 206 GTi 2.0 S16 136Bhp (no RC) Peugeot 206 Diesel: 1.4HDi 68Bhp, 1.9D 69Bhp, 2.0HDi 90Bhp Peugeot Partner Petrol: 1.1i 60Bhp, 1.4i 75Bhp, 1.6-16V 109Bhp Peugeot Partner Diesel: 1.6HDi 75Bhp, 1.6HDi 90Bhp, 1.9D 69Bhp, 2.0HDi 90Bhp Not sure? We try to respond to messages within 24 hours. If you do not receive a response within 24 hours please send us another message. Please be aware that some of our items are made to order and can carry up to a 14 day lead time. Information on lead times for all made to order items will be included in the Product Description. Upon receipt of your order you will be asked to sign for the goods received in good condition. The item "4H-Tech H4 Shift Shortshifter for Peugeot 206 GTI S16 2.0L 136bhp (No RC) Models" is in sale since Tuesday, June 6, 2017. This item is in the category "Vehicle Parts & Accessories\Car Parts\Other Car Parts". 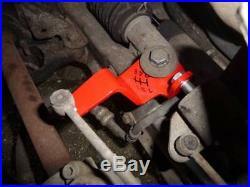 The seller is "wg_motorparts" and is located in Kent. This item can be shipped worldwide.